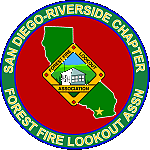 The Chapter was organized in 2008 as a nonprofit volunteer organization dedicated to restoring, maintaining and staffing the historic fire lookouts in San Diego and Riverside Counties of Southern California, principally those within the Cleveland National Forest. Since that time, two lookouts have been restored and returned to service with volunteer staff: Both High Point Tower & Boucher Hill Tower are now staffed by volunteers during the Southern California fire seasons as the chapter continues to improve and restore these iconic towers. To better understand what we do and why we do it please enjoy the rest of this page. High Point Lookout in the Palomar Ranger District of the Cleveland National Forest was FFLA-SDRC staffed 100% from 2013 through the 2017 fire season. Boucher Hill Lookout in Palomar Mountain State Park wasn’t able to be staffed, due to staff insufficiencies, every day during the 2013 season, however, with new volunteers being brought the past two years it also achieved a 100% staffing during the from 2013 through the 2017 fire season. This is all accomplished with volunteers who come from all walks of life and assistance from our supporting and sponsoring organization listed below. This all-volunteer organization is also diligently pursuing ongoing restoration at both sites.